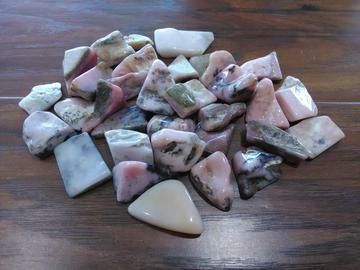 Pink Opal is a variety of Common Opals that are more opaque and do not carry that “opal fire”. It is a lovely stone to keep with you as it helps to bring the joy back into your life. Use Pink Opal when you need to get rid of old patterns that are no longer working for you, as well as giving you insight into ways that will help to enhance your emotional, spiritual and intellectual self. You can use this stone to aide in your journey of self-acceptance and love. Pink Opal can keep you calm and centered. Pink Opal soothes irritated skin; helps with issues relating to the lungs, heart, liver and spleen; is beneficial for those with hypoglycemia and diabetes. Size Range: 5/8" - 1 3/4"